Fat-free half-and-half makes a velvety smooth sauce for this low-fat meal. 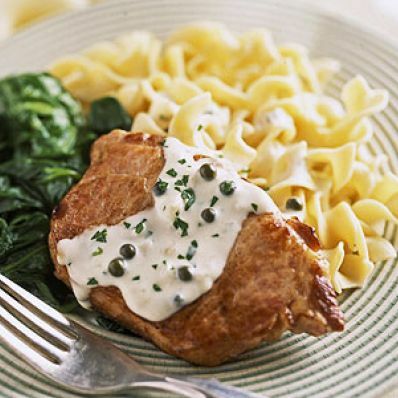 There is enough sauce to serve over the pork chops and the noodles, making for a true comfort-food feeling. 1 of 3 Heat large nonstick skillet over medium-high heat. Season both sides of chops with 1/4 teaspoon salt and the black pepper. Add chops to skillet; cook 2 minutes per side or until lightly browned. Transfer from skillet to plate and keep warm. 2 of 3 Heat oil in skillet over medium heat. Add shallot; saute 2 minutes; do not scorch. Add garlic; saute 1 minute. Add wine; increase heat to high; cook until reduced by half, 3 minutes. Add half-and-half and peppercorns. Bring to a simmer. Add chops with any juices to skillet; cook over medium-low heat 2 minutes (160 degrees F on instant-read thermometer). Stir in parsley and remaining 1/4 teaspoon salt. 3 of 3 Serve chops over noodles. Drizzle sauce over noodles. Makes 6 servings. Per Serving: 86 mg chol., 3 g sat. fat, 1 g fiber, 325 mg sodium, 22 g pro., 303 kcal cal., 10 g Fat, total, 29 g carb.